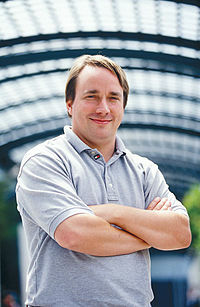 Torvalds was born in 1969 and grew up in Helsinki. At the age of 10 he began to dabble in computer programming on his grandfather’s Comm odore VIC-20. By the time he reached college, Torvalds considered himself an accomplished enough programmer to take on the Herculean task of creating an alternate operating system for his new PC. Once he had completed a rough version of Linux, he posted a message on the Internet to alert other PC users to his new system. He made the software available for free downloading, and, as was a common practice among software developers at the time, he released the source code, which meant that anyone with knowledge of computer programming could modify Linux to suit their own purposes. Linux soon had a following of enthusiastic supporters who, because they had access to the source code, were able to help Torvalds retool and refine the software. Thanks for your activity and opinion, we appreciate the feedback. I found this article about Linus Torvalds to be quite interesting I think its wonderful how this man while in college had an idea. No doubt an idea that quite a few ridiculed in the early 90’s during its conception. But look at it now!! It has grown beyond what apparently were his wildest dreams as an alternative at least if not a replacement for windows operating systems. I know for me personally I prefer using a dual-boot environment since even if I run into an issue with Window I have a backup and can still get into my PC or laptop all for free. Isn’t it how all big ideas start? The only difference is that this man, Linus sought after his idea. This must be taken as an example by all.